"Then in the sixth month Gabriel was sent from God unto a city of Galilee, named Nazareth, to a virgin espoused to a man whose name was Joseph, of the house of David, and the virgin's name was Mary. And the Angel came unto her, and said Hail, thou that art highly favored, the Lord is with thee, blessed art thou among women." Mary is even more astonished by his explanation. How can this be when I know not a man? Gabriel reminds her one thing above all: ...With God nothing is impossible. In earlier art, Gabriel is usually shown as a majestic figure, richly robed and holding a scepter. He is the principal figure while the Virgin is shown as receiving the Angel with the utmost submission and deep humility. 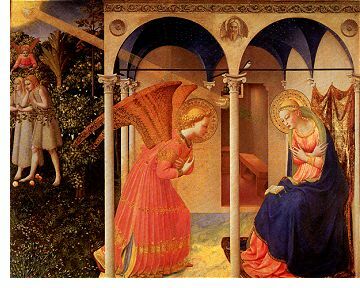 After the 14th century, a change takes place in the importance of the Virgin and the Angel. The Virgin becomes the more prominent person and the superior being.